You are here: Home / autumn / What’s Your Favorite Autumn Recipe? What’s Your Favorite Autumn Recipe? When I think of autumn I think of the harvest of apples, pumpkins, cranberries, and corn. Just think of Thanksgiving dinner, and what American doesn’t love Thanksgiving? I love to cut up a red and green apples and have the kids close their eyes and have a taste test. See if they can tell which tastes is the red apple and which is the green apple. You can do this all year round to get kids to eat healthy fruits and vegetables. We do this with green and red grapes, broccoli and cauliflower, and different types of lettuce as well. Below is a recipe and some children’s books to help your charges enjoy the tastes of autumn. Heat the oven to 375°. Combine the flour, 1/4 cup of the sugar, the brown sugar, and the butter in a bowl. Mix the ingredients with your fingertips to create pea-size crumbs. (Alternatively, pulse the mixture in a food processor 10 times or so). A squirrel, a duck, and a cat happily cook and coexist deep in the woods in an old white cabin until the duck starts to question things. He questions things like why does he always have to add the salt to the soup, but he never gets to stir. Beautiful illustrations add to this original tale of friendship, sharing, and pumpkin soup. There is a great recipe in the back of the book. Have you ever wanted to make your own applesauce? This is the book for you! Directions for applesauce making and canning follow the story. This is a great fall story-time read-a-loud- all about a family making applesauce. Alex and Abigail join the whole family in processing and selling apples and apple cider at their grandfather’s farm. 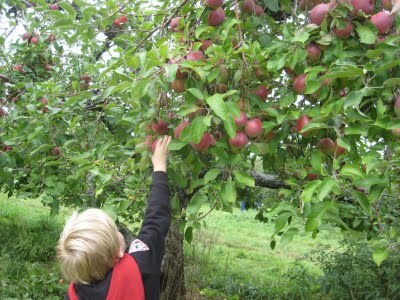 Visit Comstock Farm with a little girl and her parents to pick apples, pumpkins, and enjoy some delicious apple cider. A perfect choice for a Fall story-time. What is your favorite Autumn recipe? Apple pie and pumpkin pie are my favorites! I have had charges that loved when I made homemade applesauce after we went to orchards. Then we would have it ala mode. Any and everything apple, cranberry or pumpkin. I love pies and breads and crumbles and butters and preserves. FYI just wanted to let you know I added the ingredients to my shopping list so I can make the crumble recipe for the family tomorrow. Apple crisp is my favorite!